Rubelite is the name for pink tourmaline. Pink is an exceptional color for minerals. Rubelite is therefore very popular and is often seen as a symbol of love. Verdelite is the name for the green tourmaline. Usually this crystal is clear to soft green, but also dark green can occur. Combinations with rubelite (pink tourmaline) or Indgioliet are rare and very popular! A very popular color combination of tourmaline is green with pink (verdelite with rubelite). 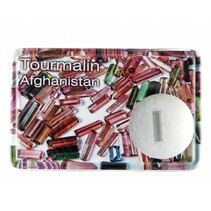 This variant is called watermelon tourmaline and it is not hard to guess why. The color differences within the tourmaline crystal are due to the changing conditions during the growth of the crystal. This crystal is good for the heart, lungs and skin. It promotes peace and relaxation and helps you to love yourself. it is also an aphrodisiac that attracts love in the material and spiritual world.